We live in a world increasingly governed by algorithms. Sadly these algorithms aren’t creating a more neutral world of equitable outcomes; they are baking in historical injustices long present in society at large (1). Not surprisingly, those who are currently denied power in society are the most at-risk in this data driven future. Their voices should be amplified and set the agenda. The Data for Black Lives (twitter) organization works to bring together one communty of folks working on this — data scientists, organizers, and more. Over the weekend I was honored to be invited to create an experience for their second conference. 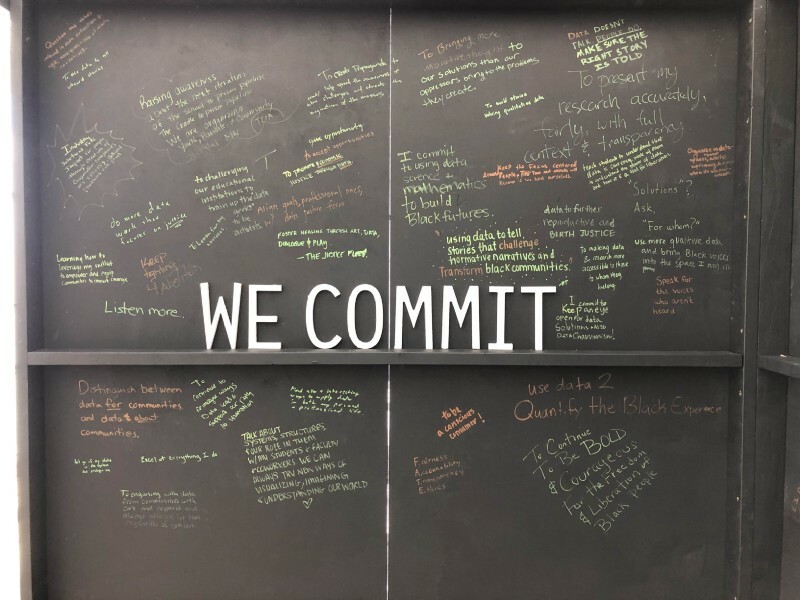 After chatting through some ideas with them to understand their goals, we decided to focus on encouraging attendees to share their commitments and their demands for a more just data present (and future). I designed and created the Just Data Cube to do this in a fun way that would also make the otherwise-boring common space a little more interesting! Attendees add commitments to themselves on the inside of the cube. 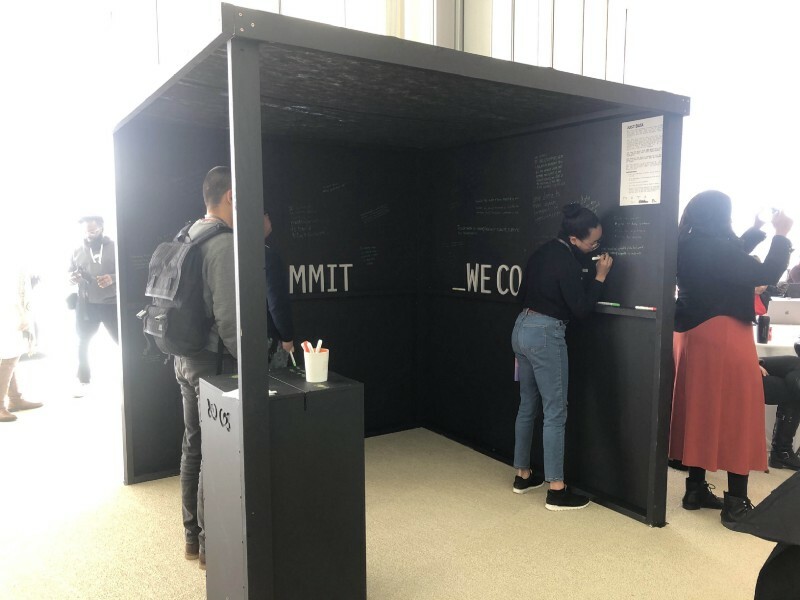 The 7-foot cube invited people to write their commitments to themselves on its inside walls. What actions did they want to take to create data-driven justice? Of course, it isn’t just up to us. Organizations, companies, and governemnts are crafting the data-driven survelliance society we live in. So on the outside they were invited to write their demands of those actors. What must the data-powerful do to create a more equitable approach to data. My hope was to create a space for people at the event to share how they approach to working on justice in their work with data. Similarly, in the spirit of founder Yeshimabeit Milner’s open letter to Facebook, I wanted folks to share their demands of those in power that have all the data. 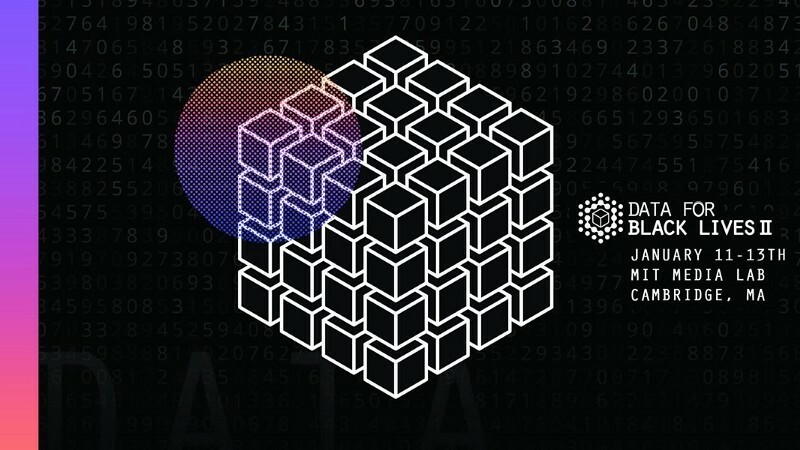 The Just Data Cube was more than simply a wall for graffitti. 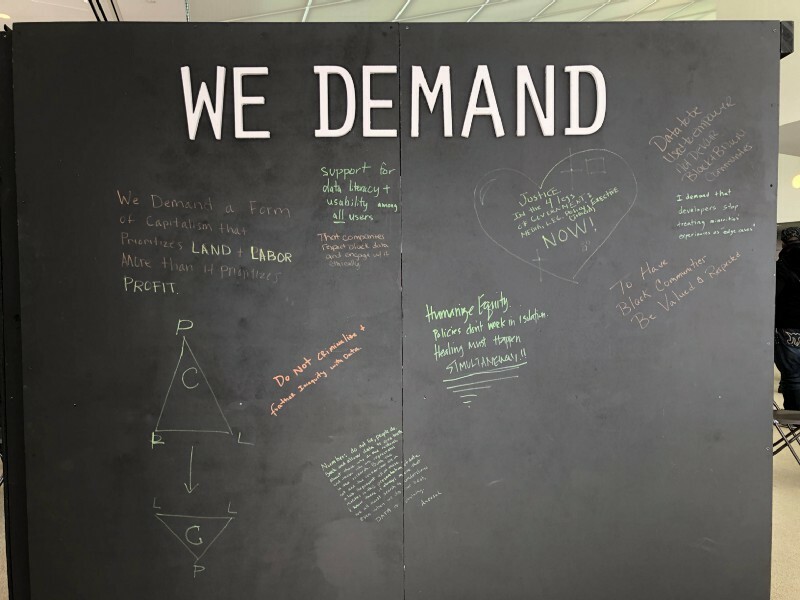 These commitments and demands inspired other participants that read them as the wall filled up. This qualitative dataset (once we type it up) will feed into other programs and processes D4BL has underway! they read the commitments and demands from other people. The Cube livened up the otherwise dry conference space with a unique invitation to break the rules — it encouraged you write on the walls! I talked with a lot of the people writing up comments, and got the overall impression that they were both delighted (to have a fun thing to do) and also challenged (the have the prompt be one that forced them to think). Thanks to the D4BL organizers for giving me a chance to participate, and if you were there I hope you found the cube both fun and inspiring! (1) To learn more about this see my older post about algorithms as mirrors, the Algorithmic Justice League, Algorithms of Oppression, Weapons of Math Destruction, or Automating Inequality.